Another brilliant 2007 Rhone Zone gem that could have you wanting to high five the Pope and possibly have you considering becoming a convert? Now, okay maybe that last bit is a stretch, but a high-five at the very least is in order, right? This wine is ready to rock soon as you uncork the bottle, it's dressed to impress. Loaded with underbrush and piped with wild black licorice, the kind you'd likely encounter traipsing around on a local San Diego hiking trail, on a warm sunny San Diego day. Here's what I found, roasted, but not overly ripe dark plum and ripe cherry which all quietly play bass in the background, while tar, figs, more underbrush and other spices jam on the sax to a harmonious beat that will have your toes tapping. The tannins are as tame as a tabby and so well integrated, there's nothing but wine drinking pleasure here. I'm awarding this wine the highly coveted "drink now and drink often" designation. While it sells for $47 at some wine stores, the wise vino sapiens shopping around the internet can find this bad-boy selling under $40, making a very nice wine to uncork with family and friends on any weekend. 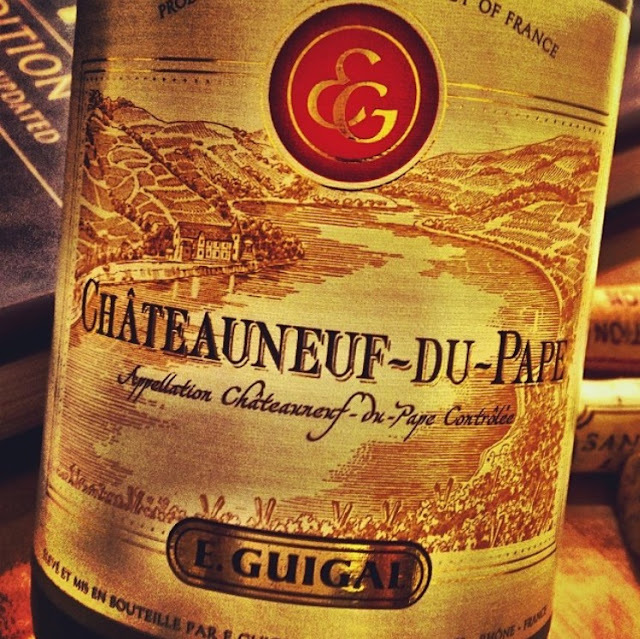 A bit of history: The name Chateauneuf-du-Pape means 'new castle of the Pope' and refers to the fact that the town. A great spot to set up shop, located just north of Avignon, and was chosen as the new home for the Pope's court way, way back in the early 14th century. "Robert Parker love him or loathe him [you decide] commented on Marcel Guigal that "In the past 20 years I have spent visiting wineries and vignerons, I have never seen a producer so fanatical about quality as Marcel Guigal." While many folks familiar with the Rhone Zone, adore and admire longingly what some call the prestigious Northern Rhone regions, like Hermitage. 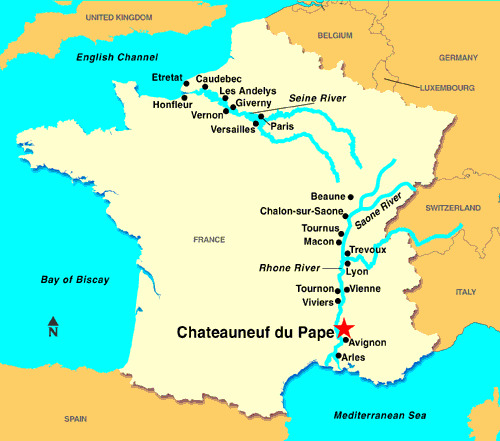 The truth is the north only accounts for about 5% of all production of the entire Rhone Zone. The remaining 95% is made in the south under far-less-prestigious and lesser known names. Now that said, the south does have some of its own red-carpet walking prestige; it’s known as Chateauneuf-du-Pape. Châteauneuf-du-Pape vineyards are farmed organically or biodynamically, and the region's abundant sunshine and frequent wind (called le mistral) practically preclude the need for treating the fields with herbicides or pesticides. Whether you agree with Mr. Parker or not, like or don't like his use of the 100 point scale, I think we can all agree on one thing he knows CDP like the back of his hand and has some excellent insights into this region. This wine has everything the average vino-sapiens is looking for via earthy, mineral-driven nuances, [you literally taste the vineyard dust] engaging aromatics which draw you in for the first slurp. A food friendly wine with a gentle verve of dark and red fruits pulsing through its soul that will make you sad once you've poured the last drop from the bottle. Even the garden variety wine-twirler will immediately "get" this wines easy going, yet very sensuous personality. This is the style of wine which makes food pairing choices so easy and wonderfully fun. I can't imagine too many things that would not pair well with this wonderfully well-made wine from a stellar vintage. If you've never taken a visit to the Rhone-Zone via bottle, plane, train or automobile; then this folk is your ticket to ride. This is a wine that will come out shake your hand and you'll become fast friends. It will leave you wondering why you had not met sooner. My score on this wine is 94 points, the kind of wine to purchase by the caseload. It’s an easy, fun and flavorful thrill ride, so very much worth the price of admission. Until next time folks, sip long and prosper cheers!